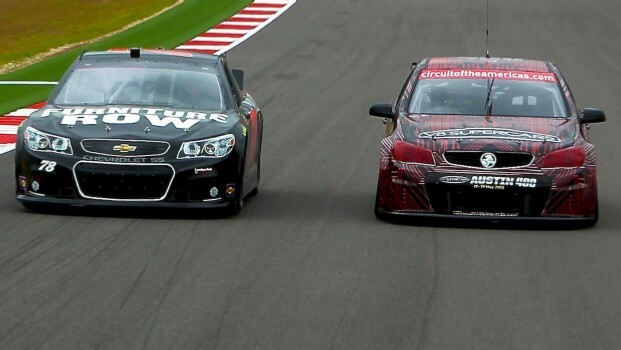 The boys have been out on track for the Driver Swap at the Circuit of the Americas in Austin – see the pics below, with James Courtney and Kurt Busch hitting the track. Courtney tweeted after the experience: "That was nuts... Felt like I was wrestling a bear." Meanwhile, Fabian Coulthard has spoken to Sunrise about his time in the V8 Supercar at the circuit. The Lockwood racer said the circuit was unbelievable and can't wait to race there in the middle of next month. "It's firstrate, the facilities are great, the track’s phenomenal, there's not a bump in sight– you can’t ask for much more," Fabs said of CoTA. "It’s been awesome, we’re just cutting laps, taking media for rides around the track, and I’m getting a couple of cheeky laps inas well. It's good for me and our guys at Lockwood Racing but we’re having a good timeand getting the job done, so it’s really good... We’re in the box seat getting to cut laps now, which is unbelievable." The only circuit Coulthard could compare Austin to was Bathurst. "There's nothing like it (other circuits we race on).It’s one of those tracks that’s got high speed, low speed, up and down, prettymuch a driver’s dream. The only place you can kind of put it next to isBathurst, but Bathurst is very iconic and a stand-alone race." More to come from CoTA.